Hotel de la Porte Dorée, Paris. de la Porte Dorée Hotel Paris. 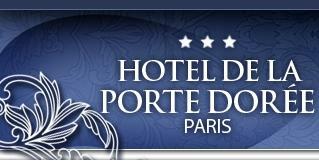 If you are looking for a hotel with a warm personal surroundings, The hotel de la Porte Dorèe is the ideal destination. Cosy, with a family, home style atmosphere, like a private home, the hotel is accessible by all types of transportation, which makes it easy to get around the city for business or touring. The top priority here is harmony, courtesy and professionalism from both the staff and the owners that are always at your beck and call for whatever you need. The rooms are comfortable and offer all services, making it the ideal place to relax in tranquillity. In the mornings a lovely breakfast awaits you with all your favourites to get your day off to a good star. Your home away from home awaits you in Paris.